Casa Swa is a super luxurious modern villa (225 m2) on the Silver Coast of Portugal about 60 km north of the capital, Lisbon. 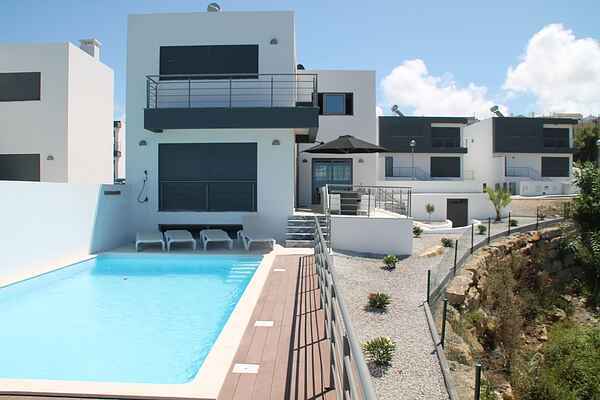 The villa is located in the authentic little village of Atalia de Cima, just 400 metres from the Atlantic Ocean. You don't have to worry about finding enough relaxation here. In addition to the private swimming pool, various terraces also provide comfortable outdoor living, where you will find a large dining table and various sun loungers among other things. But best of all is the spectacular sunset every evening, which you can watch from your own terrace. The game room in the basement is the place to be for guests of all ages. Not only is there table football here, there is also ... an air hockey table! The interior design and layout offer lots of luxury with a capital L: five bedrooms, one with an en suite bathroom and a balcony with a sea view, two extra bathrooms, a deluxe kitchen with a bar and every imaginable built-in, and much more. A true holiday villa. The nearby restaurants offer delicious meals. The fish is often caught that very day, and you will be pleasantly surprised when you see the bill. A visit to the medieval city of Obidos, and of course Lisbon itself, is certainly worth the trip. Golf lovers will be happy to find several courses within a radius of 25 kilometres. For years, these golf courses have been considered among the nicest in Europe. And venturing inland, the verdant countryside with its pristine natural beauty is certainly worth seeing as well.